Falls are one of the greatest causes of serious health problems among older adults. Biodex has established a Fall Risk Screening & Conditioning protocol that allows residents to enter a program with data-driven goals. The easy to understand feedback keeps people motivated to improve their results. The program and associated technology, will not only help reduce a patient’s risk of falling, but can be used to rehabilitate total hip and knee replacement, as well as a wide array of orthopedic and neurological conditions and generally improve overall mobility. The Biodex Fall Risk Screening & Conditioning Program is based on well-established science and uses technology to create an objective and efficient program. Modifying the factors that lead to falls will increase mobility and confidence, both critical to maintaining personal independence. The program is a simple combination of risk-factor screening including analytical balance testing in conjunction with universally accepted normative data and medical protocols. If a patient is found to be at risk of falling, there is an array of interventions and exercises that can help restore balance and reduce the risk. 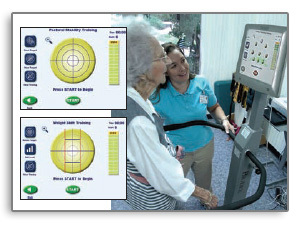 Intervention is supported by patient education and exercise plans. Biodex supports intervention with patient education and exercise plans. The Balance System SD can identify a potential problem in just two minutes. The Biodex Fall Risk protocol of balance exercise will improve an individual’s ability to remain upright under challenging conditions. Strength is a critical contributor for a rapid response to a balance disturbance. Testing will identify weakness and, if necessary, exercise will significantly improve lower body strength. Independence is directly related to walking speed. Older adults typically display a slower walking speed, with shorter steps, varied in length. These are all factors related to falls. Senior safe exercise equipment, such as the Biodex BioStep, can help strengthen and build endurance of muscles; specifically those associated with ambulation. With the population aging, the rate of fall-related injury or death is a growing concern. Studies show balance, gait, strength and flexibility training not only help improve mobility and confidence, but help reduce the risk of falling. The Balance System™ SD adds objectivity to assessment and training that will help keep seniors on their feet. to improve during exercise training. Bi odex is committed to helping drive referrals to your facility by providing clinical and business support. When you invest in the Biodex Balance System SD, you gain access to a series of marketing materials and sample communications to assist you with physician and patient education as well as community outreach to increase awareness and build your Fall Risk Screening & Conditioning Program. Designed to educate older persons and family members on the benefits of screening for potential risk of falling. Adhere your own facility label and place brochures in referring physician offices in the community. Generate awareness within your facility or community. These colorful posters regale the benefits of fall screening to patients and family members. Materials include customizable flyer and sample letters to referring physicians. Materials include sample letter and pamphlets. Includes Fall Risk Screening & Conditioning Program, printer, printer stand and CTSIB Indexed Pad. “ I used to do this exercise at home on a regular dining room chair but this is much better. I love it. Balance technology users receive educational resources, marketing materials and a photo contest as they help keep seniors on their feet.